The Rietveld Schroder House in Utrecht 1924. 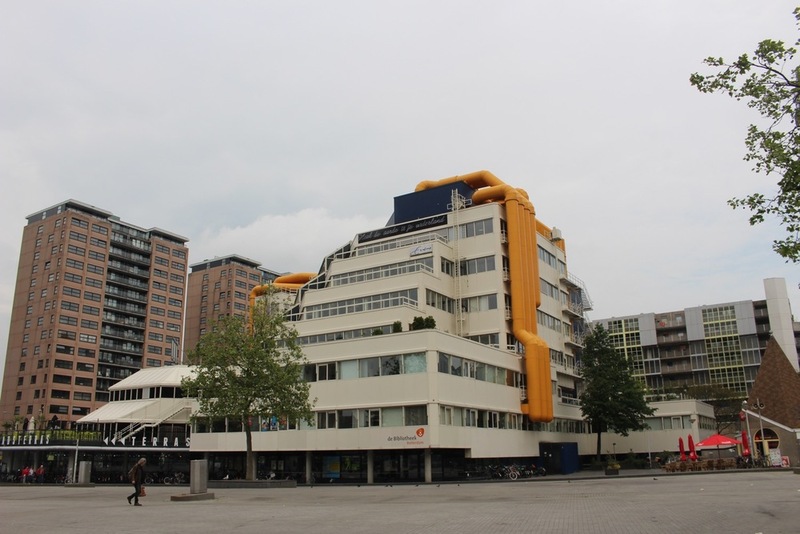 One of my goals in visiting the Netherlands was to see the city of Utrecht and the Rietveld Schroder Hose. Utrecht, the Netherlands, is a beautiful medieval university town with some awesome designs from the modern era and incredibly creative and colorful new modern designs. We zoomed by too fast to photograph many of these since Jon was navigating the busy streets in our rental car. We reached our destination, the Rietveld-Schroeder House built in 1924 and designed by Gerrit Rietveld where we were shown a documentary about the process of conceiving the house that was a total break with traditional architecture in the 1920's. A Unesco World Heritage Site, the home is considered an icon of modern architecture. At the time Reitveld, in a huge break with Dutch tradition, said he was designing a house to last only 50 years and then it would make way for something new. To satisfy building regulations Rietveld had to make some compromises but today you can see that it is as much sculpture as house. Imagine the shock in 1924 of the neighbor living in the red brick home next door. The early open plan design grew on the widow Schroeder who wanted to make a comfortable home for her children who had just lost their father. Rietveld also designed the famous Red and Blue Chair in 1917. The highway underpass by the house is finished in Delft style tile covered with Rietveld's chair designs. Rotterdam in the Netherlands is one of the world's busiest seaports. Rotterdam was completely flattened by Nazi bombing raids in 1940. After the war Rotterdam rebuilt modern. Modern is everywhere including a collection of amazing modern buildings located on a large public square. Here are just a few examples including the Cube Houses and the "Pencil" by Piet Blom, the Centrale library by Jaap Bakema, the Markthal by the firm MVRDV. We ate our lunch in the Markthal under the brilliant overhead mural. The Markthal is three stories with the third story being primarily eating spaces and the lower level is mostly shops. THE SONNEVELD HOUSE DESIGNED BY BRINKMAN AND VAN DER VLUGT. TEXT AND PHOTOS BY PAM VANDERPLOEG, COPYRIGHT 2016 WEST MICHIGAN MODERN. WMM recently traveled throughout the Netherlands and toured the Sonneveld House and we want to share this home with you. 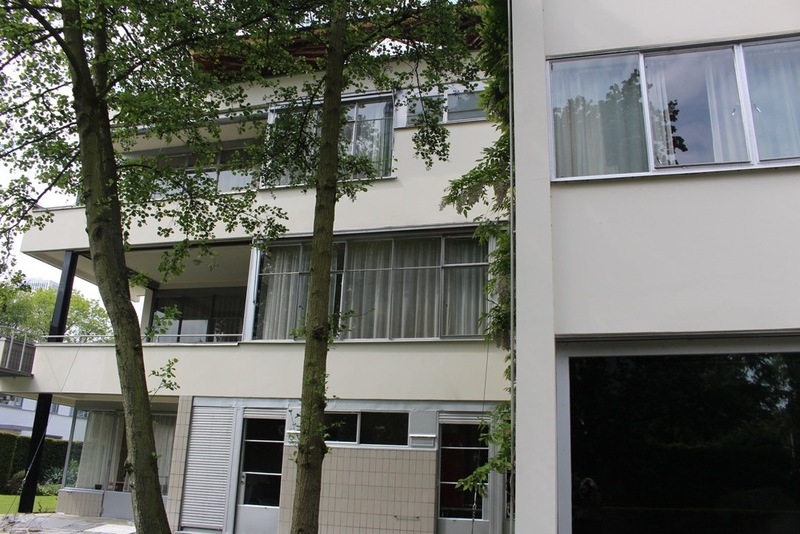 The Sonneveld home is a beautiful International style house considered one of the finest examples of the Dutch Functionalist Style. Designed in 1933 by the firm of Brinkman and Van der Vlugt for the Albertus Sonneveld family, the house has three floors plus a roof-top deck and is characterized by a sleek modern facade, banks of windows and multiple balconies with metal railings and an exterior metal circular staircase. Set on a lovely lot in the heart of Rotterdam, it is both monumental and modern. After you enter the house and pay at the front desk (this is a house-museum), you take thelistening guide up to the second floor via a circular stairway that is the core of the house, connecting the floors in traditional Dutch style. I honestly don't think we were in any home in the Netherlands that didn't have a steep circular stairway! In the Sonneveld house the staircase finishes are extraordinary, done in marble with chrome detail. The second floor contains the main living area accessed by a long and rather spartan hallway. The lovely open concept living room is a great room with a library and fireplace seating area. Tubular furniture and lamps were custom designed for the Sonnevelds by the firm of Gispen and would be highly prized in today's active vintage modern furniture market. Off the living area is a large balcony with circular stairway to the lawn below. Also connected to the living area is a dining room with orange-red built-in cabinets and display for the beautiful glassware. The dining room leads to a butler's pantry with sink and cupboards. Adjoining that is a large open kitchen with red and white checkerboard tile, food preparation area and servants eating area. The Sonneveld home is very sleek and modern. However, it was also considered to be very luxurious and comfortable, and was designed to be run by servants who had a back stairway for their use as well as for delivery. Interestingly, the maid's bedrooms on the first floor had by design the same conveniences provided in the family bedrooms on the third level. Although that concept of equality for servant and family was quite revolutionary at the time, the family bedrooms were far from sumptuous and in fact were simple and functional and just made to sleep in. The bathroom fixtures are done in a startlingly deep turquoise. The house is authentic and only had one owner after the Sonnevelds. 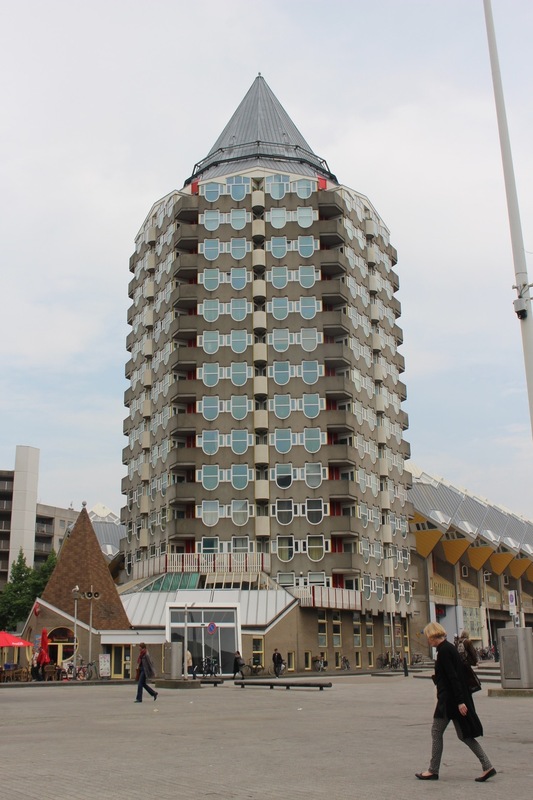 For more information on this Rotterdam masterpiece link here http://www.sonneveldhouse.com/. 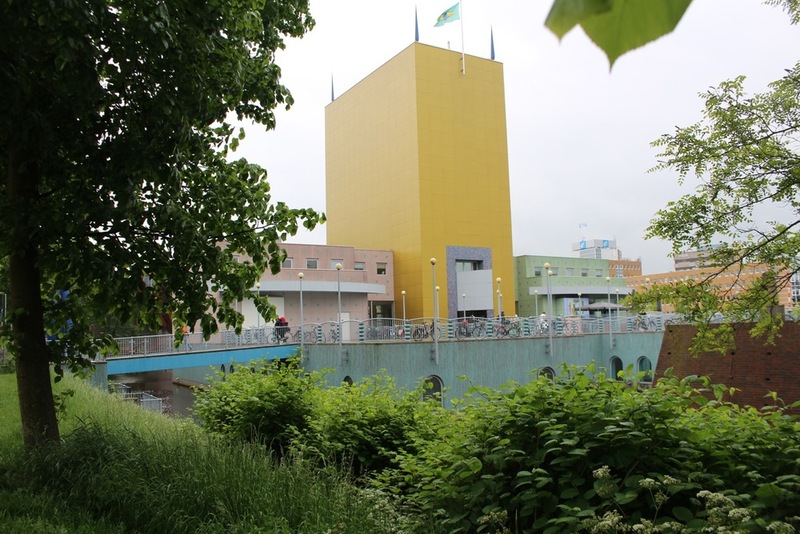 When we traveled to the north of Holland, we made a stop in Leeuwarden and Groningen to do some research looking for information on Jon's family - both his maternal and paternal grandparents and great grandparents. I made a request for a quick stop at the Groninger Museum of Modern Art because I had read about the building. I wish we would have planned a longer visit because this building is amazing and if you go you need to allow a good amount of time to explore both the exterior and the interior. Just to experience is almost shocking in a good way. You are aware of it before you are really there - a beautiful multicolor building with strong statements of orange and blue. You then notice the golden yellow tower of the main entry section. The effect is one of a very modern and colorful medieval castle with metal drawbridge and moat (well it's not really a drawbridge and moat but it feels like it anyways). And then there is the Starcke pavilion also very expressive. 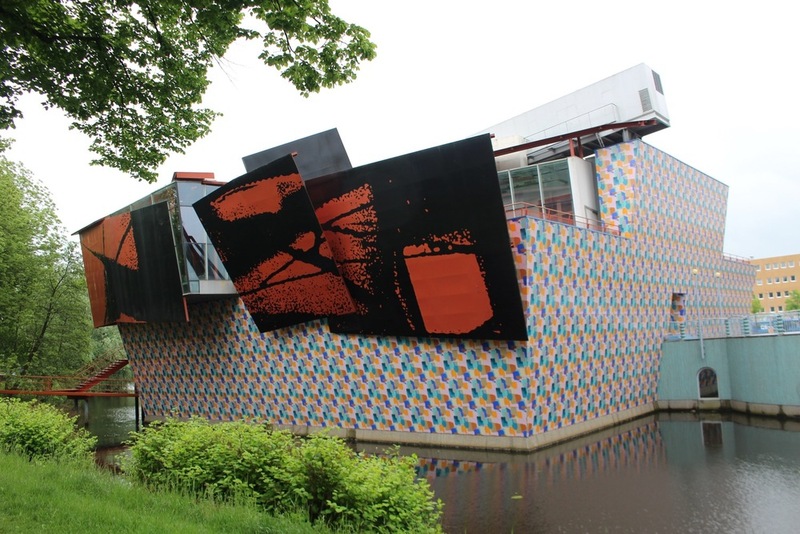 The Groninger Museum is considered to an outstanding example of postmodern architecture. Alessandro Mendini was the lead architect for the project. Architect Phillippe Starck created the Starck pavilion. The interior of the Groninger Museum is amazing and intense. There is a roster of noted architects and designers who worked on this building. To learn more about the architects of this building link here to the Museum website http://www.groningermuseum.nl/en/maarten-baas . The lush greenery and the canal location gives the Museum the ambiance of an oasis in the middle of an urban space. I had to look carefully before proceeding on foot for a closer look at the buildings. Everyone bikes in the Netherlands and they move fast -- this is commuting between work and classes (university town) and the bikes are for transportation more than leisure-time biking. As you stand at the exterior of the building poised to enter, the site you see on the other side of the canal is the gorgeous old train station that seems to call out to the newer museum across the water. This it is a fitting reminder that old and new can exist in total harmony and beauty together. 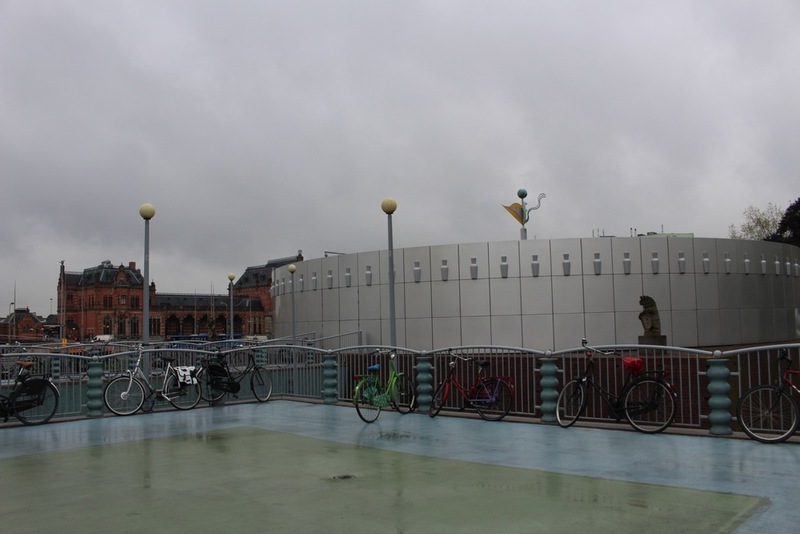 While we were in the Netherlands, we learned so much about the cool modern designs of this progressive country. Watch for more stories coming soon!